Yesterday ended with the soft sound of hot printer's lead being squirted into the molds of a pre-war Hochmann-Zander double-feed rolling press.1 Located in a great room (just off Klong Toey, at Bangkok 10110), this complicated machine was readying itself for the long night's work. No surprises2 were expected. 1 When you were a kid, I know you saw one of these presses at work. Yes, in the leader-film to Movietown News. Remember the cascade of blurred headlines as the papers shot out of the big machine ... just ready for little Tim to load into his delivery bag? 2 The term, "Stop the presses!" started in a room very much like this one. And, it was in the Hochmann-Zander assembly-works, near the dockyards of Hamburg, where the very first Hochmann-Zander double-feed rolling press was fitted with a red "STOP" button. When pushed, everything stopped. 3 Whenever a US made airliner goes down, there is a race to see who can get to the smoking pile first: the FAA people, or the "de-logoizers". The FAA, to date, has never captured a "First". 1702: The Daily Courant, London's first daily newspaper, first issued. 1845 – Self-raising flour first patented by Henry Jones of Bristol. Last night I practiced my 'time exposures'. This meant mounting my Nikon 990 on a tripod and aiming it at something. Of course, I had to hold down the shutter release button, too. But aside from that, it was all automatic. Two scenes were shot from Gore's balcony, one of the Sala Rim Naam, the other of The Peninsula Hotel. Also, I took a picture of the veranda/portico of The Author's Wing. However, Watcharee soon lost interest in my 'training'. 4 Even though Page is a Birmingham man, his heart beats in London. I unquestioningly rely on Andy to 'proof' all of my London materials. One nod from him, and it's as good as a passing grade from God himself. Equally, one raised eyebrow and the stuff goes directly into the can. Sadly, Andy was not able to give his full imprimatur to that horrific incident that 'rocked' London just over a year ago. Though he watched the film clip over and over again ... something ... somewhere ... somehow ... just didn't fit. As with the Abraham Zapruder movie that showed JFK losing his mind in Dallas, this little clip [960k MPEG] of the 'teacups from hell' raised more questions than it answered. Andy just wasn't able to say, "Yes, Alf, this is the way it happened." Someone is going to lose his or her job over this! No doubt! 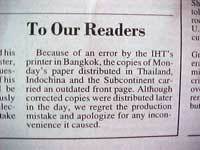 At first, I thought that one of my newspapers2 was just a notch behind schedule. After all, it was the weekend ... and since most 'dailies' also publish a Saturday/Sunday edition3 ... well, it's not unusual to find a paper caught with a late 'delivery' of some wire service feed. 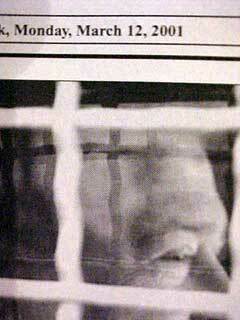 It was this terribly catchy 'behind the bars' photograph of Binyamin Ben-Eliezer4 that caught my attention. I knew that I'd seen it elsewhere earlier. But, a quick glance at the paper's date (and my watch) confirmed that today is Monday, March 12, 2001. And, as you know, it is not impossible for the same newsworthy photograph to appear in different places at different times. 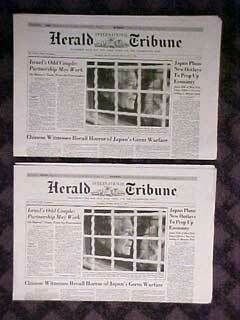 But, south of the paper's fold, there was a picture of Senator Strom Thurmond! And, an article about France softening its stance on a US missile shield ... and, a column about Japan's plans for its economy. I had seen them all; but at a different time and at a different place. Something had gone horribly wrong! Yes, dear reader, someone in charge of rolling out the March 12 edition of the International Herald Tribune5 had pushed the wrong button. Wanting the 'refresh' button, he went to the 'history' column by mistake! So, the entire front page of the "Saturday-Sunday, March 10-11, 2001" edition of the International Herald Tribune is identical with the "Monday, March 12, 2001" edition. Well, almost. As I said, the dates on the masts of the two papers are different. As are the edition numbers (36,706 and 36,707). Also, the narrow "INSIDE:" banner at the very top edge of the page is not the same. March 10-11 asked the reader to check out the ART section; March 12 pushes the reader toward the ITECH pages. But, once you leave page one, everything is back to normal. Disturbing? Yes! But, what if 'my' copy was the only one that came-out this way? That 'yesterday', my 'today' was everyone else's 'tomorrow'? Do you see where I am drifting? Perhaps tomorrow's business section will give me the day-after-tomorrow's stock prices. On Tuesday, if you see strange movements in the 'short' and 'long' markets you'll know why. 1 See, we are gently getting back into the swing of things. 2 My room is served with five papers: the Bangkok Post, the Bangkok Daily News (Thai language), the International Herald Tribune, the Asian Wall Street Journal and the Financial Times. 3 Sometimes a late Friday story won't appear under the mast until the first edition on Monday. 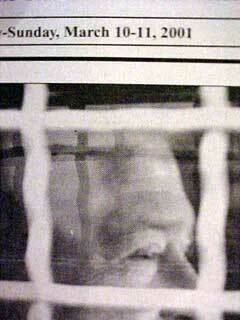 4 Who, in this picture, looks amazingly like George Bush, the father. 5 Presumably on the latest model of Hochmann-Zander double-feed rolling presses. On presses located at 29 Soi Chidlom Ploenchit Road, Bangkok 10330. Though banished to 'below the fold', the Thai Airways 'explosion' story will not go away. But, now the officials are using the word 'explosion' to describe what happened at Don Muang just a little over a week ago. Engineers from Boeing were flown in to take a look at the 'ill-fated' plane's air-conditioning system. What they found is best described as "a fault in the air-conditioning system." "What does this mean? Does it mean that we will have to suffer intolerably warmer flights in the future? Will our onboard air be less clean?" To quote a source that is unquestionably close to the investigation, it means this: "... all airplanes of the same model will have to be recalled for corrections." Whether these 'corrections' will result in less comfy flights, we just don't have the answer at this time. "But, what about the trace of RDX1 that was found in the wreckage? Surely this is convincing proof that some madman-anarchist had breached BKK's security." Not necessarily. Currently, the most widely used test for detecting the presence of bomb ingredients is so sensitive that four out of five times it will be set-off by a can of spilled Diet Coke. "In fact, if the conclusion is that it was not a bomb it would be good for the country and all concerned." After that, Police General Pornsak Durongkawibul, the national police chief, went on to say, "We prayed from the beginning [that the blast was not caused by a bomb] but there was no clear proof." "Alf, what about the suitcase?" It does not belong to Annie. 1 RDX is a component of the explosive C-4. Not even a simple "We're sorry". No, I was not expecting the editor of the International Herald Tribune to fall on a sword, or even to go prostrate into the confessional. But, surely, something should have been said about the whole front page of his newspaper being but one big fat error. More on the little plane that just won't go away. Reduced, in the eyes of Lloyd's (the company's London underwriters), to something "unrepairable", it's now a tale that no longer deserves front-page occupancy. Today's Bangkok Post has downgraded its coverage to a black and white photograph in the HOME section of the paper. The photograph is quite eerie. It shows the great 'bird's' midsection being gently lifted from its now-chilled funeral pyre ... chomped off is the head; gone, too, the tail. From the engines, the undercarriage and most of the port wing, strange things are dangling. From where the tail once was ... right at the point of the great chomped wound ... the plane's entrails and mangled organs lie or hang in disarray. This is just in from Andy Page. He is, of course, referring to the infamous "Terrible Tea Cups for Toddlers" ride. That Green Park disaster that ever so certainly snuffed out the lives of two adorable twins ... right before the eyes of their adoring parents. That sickening snap of the restraining cable that allowed the twin forces of gravity and acceleration to drive their adorable little shoes right through the tops of their adorable heads. Yes, the 'just-for-kiddie' ride that went horribly awry. Though this disaster took place a little over a year ago, it has come up in our conversations several times during the year ... most recently, last Sunday. Like the Abraham Zapruder home-movie that showed much of Kennedy's brain being air-lifted into Dealey Plaza, this Terrible Trots for Teens ... I mean, Terrible Tea Cups for Toddlers ... film will be watched over and over again. And, as with the case of the Dallas movie, not every viewer will see the same thing. Whatever, Andy Page gives us a little background on the 'background'. Yes, why is Green Park named Green Park? Alf .... The "incident" took place in Green Park. Do you know why Green Park is termed thus? A Queen noted her King picking blooms for one of his other "affections" and ordered from that day forth no flowers should grow in said park and hence the name. 1 When translated into English, the phrase, "My fault, my fault, my most grievous fault", really doesn't tell us what is now expected of the remorseful sinner. A scale, of sorts, is needed. For those of us brought up as Catholics (especially ones who did hard time in a Jesuit run facility), the numbers on our scale are recognized worldwide. Being both qualitatively and quantitatively universal, they conveniently allow a pygmy in Africa to know exactly how bad was that Eskimo in the Arctic. An example: for a half dozen 'Hail Marys' God would happily mark your sin-voucher "Paid in Full". Provided, of course, that your 'indulgence' was carried on God's own books as a minor one. But, when looking at the bigger numbers on this measuring-stick, our all-loving God will require a bit more from you before coming up with that all-forgiving pat. Here, 'Our Fathers' (due to their raw length) act as a useful currency. 'Stations of the Cross', the largest coins in circulation, are pretty much reserved for paying God for the big-ticket items. 1 Making this whole mad-cow problem either an insignificant bother, or something that's about to break the back of the Bank of France. The apology did not gush! But, it did make it to the front page. Tucked tidily into the "Agenda" box, the "To Our Readers" message was brief: it cast all the blame onto the Bangkok printer. Not even a smidgen of fault was reserved for the door of the editor. There was no explanation of how this "outdated front page" came about. Nothing! I mean, it was treated as if this sort of thing could happen just as easily as ... say, a cup of coffee spilling on your trousers. Hey, I am not trying to equate this with the 'problem' that Thai's 737-400 had at BKK the other day ... sure, the folks at Don Muang need more than "there was a problem with the air conditioner" or "something exploded under the seat and your plane is now junk". But, it would be nice to know how it came about that "copies of Monday's paper distributed in Thailand, Indochina and the Subcontinent carried an outdated front page." Sometime back in the '20s the Quality Bakers of America, in an effort to boost the sales of white bread,1 published a little booklet of 'white bread' recipes. As in the case of many 'cook books,' little is known about what happened to them after they left the seller's shelf.2 I suspect that this little compendium (found in the family library) had seen similar 'under-use'. But, dearest reader, what better place and time to taste-test these little offerings than at, and through, the good offices of the kitchens of The Oriental itself? 1 Loaves of this sort were considered to be 'poison' by many. And, when the 'doughboys' came home after The Great War (1914-18), they told many tales of a faraway bread that was much tastier than what Mom was able to find in her local shop. Though thirty-two slices of Mom's stuff could be squeezed-of-air into a ball the size of a dime, what good was this? 2 Publishers of academic journals have done a better job of following up on what happens to their stuff once the things are published. Conservative figures show that less than 2% of 'academic' articles are ever read from A to Z by anyone other than the author or his enemies. Dear Francophile, even though my own front page doesn't push it, I am always aware of what is happening next door. Most of you already know that I live directly to the right of (as seen from the river) the French Embassy. That my Gore Vidal rooms, perched more than a dozen floors above those of the frog, are well placed for keeping track of the comings and goings on this historic bit of Bangkok. And, up until the start of the year, the French had allowed their property to grow very 'long of tooth'. Not so, any more. Bit by bit they are tearing the old place apart ... and putting it back together again. Everything will be where it once was and everything will be where it should be. This is a big job! Single-handedly, I have taken on the responsibility of tracking the work. An hour never passes without a glance out of the window. Some glances are rewarded with signs of accomplishment; others, sadly, with just sighs ...: "where have all the workers gone?" "But, Alf, we have seen so little evidence of this ... "tracking", as you call it. Cheesy hunts for Miss Chopsticks, yes! Near plagiaristic embraces of NEWNES, Mr. Wescott and all those 'long-dead' writers from the IHT ... yes and yes ... over and over! And, anniversaries of God only knows what weird event ... yes, yes and yes ... and, will that, too, never end?" Hold on, Jack! You are starting to sound like the reader who enjoys watching paint dry. Not the type of person I want on my web site. You want instant satisfaction? Go CNN! But, for those of you who are concerned with the renovation of this fine old Bangkokian property ... and, with the loving care that only the French know how to give to a job of this importance ... I am ordering up a special little button just for you. Pressed once and it will take you 'next door'. 493: Odoacer slain by Theodoric, King of the Ostrogoths. 1079: The Jalalian (or Seljuk) Era began. Help is needed with both of these. Anyone? The Htoo twins; little Luther and brother Johnny! Yes, back in the arms of their mother. With all the sad news of late ... world markets tumbling ... airliners bursting into flames1 ... flagship newspapers getting their covers all wrong ... disappointing white-bread recipes ... well, it just makes one feel all 'tingly-good' inside when a story like this pops up on our front page. Like tomorrow's2 rosy news from Down-Under, about whores giving a helping hand to the 'halt', this front-page word of a family reunion goes well with our morning coffee. Well, Mr. Impatient Reader, for starters the world will no longer see these two adorable twins paired cruelly by the press as the "angelic-looking Johnny" and his "tougher-looking, cigarette-puffing brother, Luther." Ratchaburi, AP - The teenage twins who led the God's Army rebel group have been reunited with their mother, more than a year after the family was split during fighting with Burmese troops. The mother arrived on Tuesday at the border patrol police base in Suan Phung district, where Johnny and Luther Htoo have been held following their surrender on Jan 16. The twins are believed to be 15 years old. The father is expected to join them soon and the family will stay at the camp until the government makes a decision on whether to give them refugee status, said Pol Lt-Col. Somchai Visutsuwan. "We will continue to confine them here until further notice from higher authorities," said the chief of the border patrol police base. The twins' parents already have refugee status and have been living in the Ban Ton Yang refugee shelter nearby. God's Army, which at its peak had about 150 fighters, provided minor resistance in a wider guerilla war by Karen rebels fighting for autonomy in Burma. The twins' legend began around 1997, when Burmese troops came to their village during a sweep of Karen areas. The mainstream guerilla group, the Karen National Union, reportedly fled while the twins rallied some men and directed a successful counter-attack. God's Army stopped fighting after they lost their base at Ka Mar Pa Law, just inside Burma, early last year. During the fighting, they became separated from their parents, who trekked to Thailand. Johnny, Luther and their small band held out for about a year before arriving in Thailand, driven by hunger and exhaustion. Fifteen followers who surrendered with the twins are also staying at the police base. On Tuesday, seven of their relatives joined them at their base along with the twins' mother. Authorities allowed photographers and television crews into the base yesterday to shoot pictures of the twins, who did not speak much except to say they were happy to be with their mother. Asked how they felt about being the focus of media attention, the long-haired Johnny said: "I am afraid." Since their surrender, the twins have demolished the myth built around them that they possessed mystical powers to repel bullets. The twins became icons for youthful rebels around the world after the circulation of an AP photograph showed the angelic-looking Johnny next to his tougher-looking, cigarette-puffing brother, Luther. Well, dear reader, let's just let our zoom lens take a closer look at these faces. Are these the happy faces of a family reunited? Does Mom appear to be bubbling all over with joy ... or, are darker thoughts roaming around in her mind?3 How about the kids? For a while there, they had an endless supply of cigarettes, no sharp parental scolds because of a messy room ... and the big one: God status with their followers. 1 For 'no apparent reason,' some would have us believe. 2 In Bangkok it is easy to read 'tomorrow's' news 'today'. 3 When kids make the headlines, it is usually for something that will bring rain and lightning to the homestead. There are just so many shiny spots in this world for teenage lottery winners, Oscar candidates and gold medal places at the Olympics. I think that my Miss Watcharee definitely has 'standing to sue'1 on this one. She is unquestionably Thai! But, that funny-looking couple waltzing around the dance floor ... while 'joined' at the forehead ... they claim to be twins from Siam (well, 'Siamese Twins'). Ha! We don't believe that for a minute! There is a little tool in Photoshop 6.0 that can do this easily and convincingly to any couple. So, Mr. WWN from Lantana, we way over here in far away Bangkok are not convinced. No, not at all! Do you want us to walk away from the magazine rack with empty hands? No? Then how about an X-ray to prove that these head bones are really stuck together? 1 Legalese for everyman's right to drag another into court and demand that something be done. 2 "Sampling" is the euphemism for it. But, this is what the camera actually saw: "In one nauseating instance, a baggage handler came across a bunch of Oreo cookies in a plastic bag. He gingerly twisted a cookie apart, licked the creamy middle, then pushed it back together so that it looked untouched. Then he methodically did the same to the 15 other cookies in the bag!" 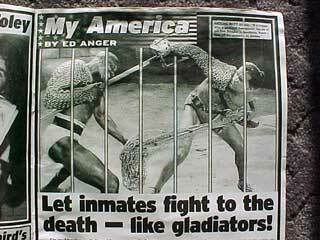 Ed says: "If a convict wins a gladiator tournament like my ol' pal Kirk Douglas in Spartacus, knock a year off his sentence, by jiminey." Yep, the Big Guy has a way with words. My son, David, has a lawyer-neighbor back in Florida who makes a good living out of suing restaurants, hotels, bars and loads of other semipublic places for not providing adequate facilities for "... the halt, the dumb, the deaf, the limpers and the blind." I am not sure if the Americans With Disabilities Act covers Nevada whore houses; but if it doesn't do so now ... well, Dave's neighbor will be one leg up in the future if the guy makes an exploratory trip Down-Under ... if only to check out those special needs of "... the halt, the dumb, etc ..."
Melbourne, AP - A brothel has installed a wheelchair ramp and other facilities for the handicapped in what advocates hope will be the start of a nationwide trend. The Pink Palace recently opened what is believed to be the first disabled access room in an Australian brothel, with enlarged doors to accommodate wheelchairs and a sit-down shower. 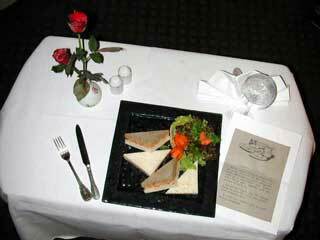 The move was praised by groups for the handicapped, saying they hoped other brothels will do the same. George Taleporos, a graduate student doing a doctoral thesis on sexuality and physical disability, said yesterday the brothel's facilities mean handicapped people can visit it alone without someone else's help. "The thing about having independent access to a facility like this is that the experience can be more private and personal, and fewer people need to know about what you are doing." Mr. Taleporos, who is confined to a wheelchair, said many disabled people use prostitutes and brothels because it is difficult to find sexual partners. "It's harder for people with disabilities to actually meet people and go to nightclubs, and do all the things that people normally do," he said. Lily, a prostitute at the brothel who would only give her first name, said catering to the needs of the handicapped would help boost its profile. "I think it is very important these days in this industry that we're able to help people who have special needs," she said. Disability Rights Victoria, an agency that aids the handicapped in Victoria state, said it hopes more brothels will install facilities for the handicapped. "We hope this will cause a flow-on effect right across the country," said spokesman Glenn Cardwell. 1781: The Corn Law Rhymer, Ebenezer Elliott, born. We are no closer today than we were back then ... wondering about this man and his life. Maybe Andy Page missed this one on the first go around. Andy?